Another WTF moment!! 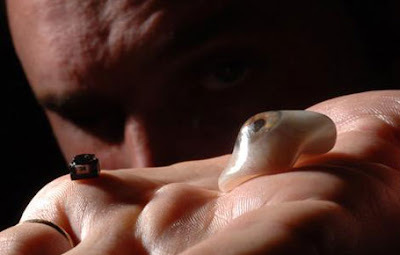 A man who lost half his finger after a motorbike accident, has had the finger replaced with a USB drive. Jerry Jalava is a computer programmer from Finland. The two-gigabyte prosthetic finger (thank goodness) is not permanently attached to his hand. 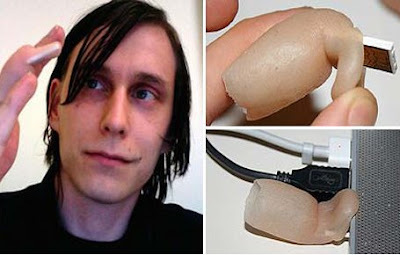 This allows him to leave his finger in the computer USB port and replace it on his hand once he's finished his uploads and downloads. On the surface, the silicon prosthetic looks like a normal finger. But the top can be peeled back like an onion at the tip, to expose the USB drive. Mr Jalava said that he uses the drive as storage for "photos, movies and other useful files". It all started as a joke by one of his doctors... an aside comment suggesting that he should replace the finger with a thumb drive, and this was enough to set the programmer off on creating one. Now if this isn't freaky enough, another man, a film-maker from Canada has been working on a design with an unemployed engineer to implant a concealed video camera in his prosthetic eye. This is for real - the film-maker is Bob Spencer, the engineer is Kosta Grammatis from San Fransisco. They are calling their work the "Eyeborg project", nicknaming the eye as the 'Bionic Webcam'... eat your heart out Steve Austin (the original Six Million Dollar Man).